My career as a detective began when I was ten years old and in the fifth grade. Almost every night I’d fall asleep reading a Hardy Boys detective book, so I grew up looking for criminals. One evening I was buying snacks from nearby store when I noticed a young man wearing a black leather jacket, and something about him was strange. He was too quiet. He wandered about the store without saying a word, so I watched him. From a shelf of battery-operated gadgets he slipped a flashlight into his jacket, and then a small radio. He’s a thief! I thought. I told the cashier, she picked up a megaphone, and her voice boomed across the store. “If anyone thinks they can get away with shoplifting, I have my eyes on you!” The man replaced the stolen items and dashed out the front door. He was caught, we were safe, and on my way home I realized, I am meant to be a detective and I just solved my first crime. The hero of DOC AND THE DETECTIVE, young Timmy, is a modern version of my younger self, a Choctaw Indian crime-stopper. A few months later, on Christmas morning, my brother Danny was riding his new bicycle on his way to the store. He was struck by a car and rushed to the hospital with a broken arm. Late that night we heard a knock on the door. No one ever knocked on our front door after dark, unless something bad had happened. Mom opened the door and there stood a uniformed policeman, with Danny’s bicycle under one arm! “Ma’am,” he said, “I’m sorry to bother you this late. I know it’s been a hard day for your family, but maybe this will help. I took your son’s bicycle home and repaired the wheel and tire. Merry Christmas.” That night I learned, at the age of ten, that cops are people, too. Officer Holden is today’s version of the Christmas Cop. And Doc, where does he come from? I co-wrote three popular ghost story books with my friend Dr. Joe Moore, a retired university professor. When he began to slip into dementia, I helped watch over him. He soon became two people, the Doc Moore I had known for forty years and the new Doc, confused and sometimes forgetful. One morning I discovered that his maid had stolen Doc’s big blue flowerpot, filled with blooming roses. Detective Timmy must solve the crime! A groundskeeper of our local hillside graveyard, where I sometimes walk my dog, once told me, “Sometimes old people leave jewelry on the graves of friends, but don’t do it, ’cause two men driving a red car prowl around here and steal whatever they can.” Therefore—the perfect cover! 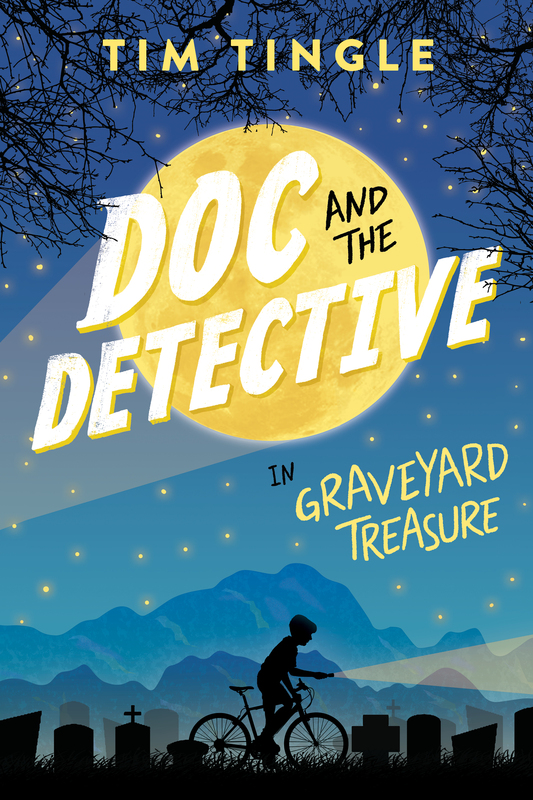 I love the dark and dangerous mystery of the graveyard at night, with Timmy flying by on his bicycle, as Choctaw artist McLain Moore welcomes readers to the world of DOC AND THE DETECTIVE. I was thrilled when Maeve Norton, Senior Designer, wrote on behalf of Arthur A. Levine Books, and asked if I was interested in creating a cover illustration for DOC AND THE DETECTIVE. I was intrigued to learn that the author of this wonderfully inventive fast-paced story for children, Tim Tingle, was of Choctaw descent; I am also a member of the Choctaw Nation having been raised in northeastern Oklahoma. I’d never been asked to illustrate a character whose life was so close to mine: the main character Timmy was a Choctaw boy living in Oklahoma. I began to wonder how such a fortuitous opportunity had crossed my path. Such synchronicities rarely happen by chance from my experience and I knew this one would prove to be special. All of the visual elements displayed on the cover are so familiar to me: from Timmy’s bike, to the mist-laden graveyard back-dropped by the rolling hills of Oklahoma being gently lit by a full moon. I felt like I had been transported back in time to my own childhood. I want to give credit and thanks to Maeve Norton, whose professional art direction and creative design brought this book from concept to finished art and to the final cover we are revealing today. This combined with the initial inspiration drawn from this most marvelous story written by Tim Tingle, whose rare talents as a storyteller encompass not just the well-honed craft of writing, but the ability to remember what it was like to be a child. Congratulations Tim. What an exciting time! Doc and Duke are celebrating in Heaven. Buster will join them tomorrow. All viewing the young detective, Timmy, solve crimes against the compromised elderly – a true Hero! Congrats Tim! What an amazing story about your brother’s bike – I’m glad he was (otherwise) OK.